Microsoft has announced that its US employees have raised over $1 billion during the almost 30 years of the company’s charitable giving program. Started in 1983, the initiative has brought in donations for more than 31,000 nonprofits and community organizations based in the US. “I’m incredibly proud of our employees, and this is truly a time to celebrate, not just because we’ve raised a record amount of funds, but also because together with our nonprofit partners, we have impacted and improved the lives of hundreds of millions of people,” said Microsoft CEO Steve Ballmer. Chairman Bill Gates pointed out that Microsoft’s employees had “been involved in their communities” since the company’s beginning, adding that the impact “can be felt around the world” three decades later. Of course, Gates himself has devoted himself to philanthropy since stepping away from the company he founded to focus on the Bill and Melinda Gates Foundation. In recent years, he has given over $28 billion to causes that are linked to saving more than 5 million lives. In celebration of the milestone, Microsoft is giving a $25,000 grant to the the four groups that have received the most donations from employees over the course of the program – United Way of King County, World Vision International, Seattle Children’s Hospital Foundation and the American National Red Cross. Microsoft’s employee giving program offers to match its workers’ volunteer time (valued at $17 an hour) and charitable contributions for up to $12,000 per year. The campaign has grown from just $17,000 from 200 employees in its first year to a projected $100 million this year from over 35,000 employees. Last year, the company raised $100.5 million through its employees. 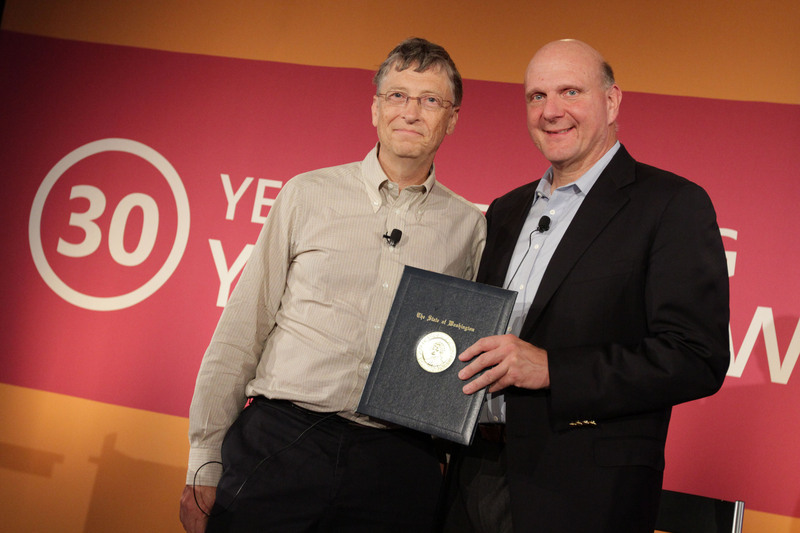 “Microsoft has created a culture of generosity that has radiated so far into the community. The standard of giving and volunteering by Microsoft employees has raised the bar and influences so many others here and around the world,” said Jon Fine, CEO, United Way of King County, in a statement. Microsoft employees have donated $1 billion, inclusive of the corporate match, since 1983. Microsoft employees in the U.S. have volunteered more than 2 million hours of their time to causes they care about since the company began a volunteer match program in 2005. Since 1983, Microsoft and its employees have provided more than $6.5 billion in cash, services and software to nonprofits around the world through localized, company-sponsored giving and volunteer campaigns. This includes in-kind donations. Though Microsoft isn’t the only US technology company to have a charitable giving endeavor, its program is one of the oldest. For instance, rival Apple only instituted its own matching donation offer last year after Tim Cook took the reins as CEO. In just a few months, the iPhone maker and its staff raised a total of $2.6 million.